Urdu is the national language of Pakistan, an official language of India, and is one of the most critical languages for understanding the Afghanistan-Pakistan region, as well as South Asia as a whole. It is an Indo-European language with influences from Arabic, Persian, Sanskrit, and Turkish. 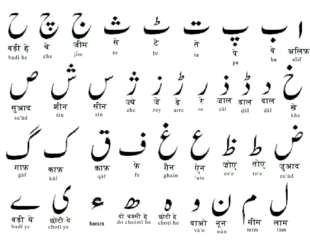 Urdu is written with the Arabic Alphabet. As it is the second most used alphabet in the world, once you have mastered reading and writing in Urdu, you will have an advantage should you choose to study global languages such as Arabic and Persian/Farsi, as well as several regional languages such as Kurdish, Balochi, Pashto, Sindhi, and Punjabi. Urdu alone is spoken by about sixty million people in Pakistan and India, but because informal spoken Urdu is mutually intelligible with Hindi and together they are considered the fourth most-spoken language on earth, a knowledge of the Urdu language will allow you to converse comfortably with almost five hundred million people in South Asia and understand the movies produces by the worlds biggest film industry—Bollywood. Urdu is taught at most major colleges on the east coast, however there is also ample funding in the form of Foreign Language and Area Studies and Critical Language Scholarship grants from the U.S. Department of Education and Department of State to continue the study of Urdu abroad during summer holiday or for the full academic year. Completion of the Startalk Summer Urdu Program will make a prospective applicant very competitive for such funding.